In Maze of Bones, The 39 Clues Book One, Amy and Dan Cahill are orphans whose world falls apart with the death of their beloved (and wealthy) grandmother, Grace. At the funeral, the lawyer calls together a select few of her many relatives into the mansion’s Great Hall and offers them each a choice: take a one-million-dollar inheritance and leave, or, instead of money, be given the first of 39 clues that “might lead you to the most important treasure in the world and make you powerful beyond belief . . . or it might kill you.” Amy and Dan take a clue, although they are mystified and confused about this (and perhaps many other) secrets Grace had been keeping all these years. Other family members take the clue too and the adventure begins. The lawyer also gives Amy and Dan the sage advice to “trust no one” and from the get go their enemies (aunts, uncles & cousins!) close in on them. As Dan and Amy try to piece the puzzle pieces together, they travel the world and learn a bit of history too, all the while barely making it out of some deadly traps! Rick Riordan (author of Percy Jackson and the Olympians series) crafts a series opening thriller full of twists, turns, surprises and suspense. It felt a lot like the movies National Treasure meets Spy Kids and The DaVinci Code (without any religion). It was a fun, quick read and I enjoyed solving the riddles with Amy and Dan. The 39 Clues series includes 10 books, each by a different well-known author (Book Two is by Gordon Korman), with a new one coming out every few months. The series presents a giant mystery that readers must try to decipher, using trading cards and a website, along with the books. Each book also contains six cards, and readers can buy additional clue-laden packs (350 cards in all). As for the jackpot, Scholastic will provide $100,000 in cash and prizes, some awarded for skill and others as part of a sweepstakes. 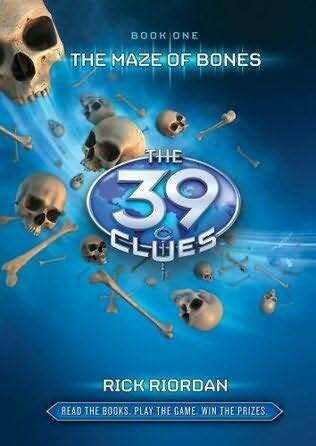 DreamWorks Studios has also bought the movie rights to the series, making The 39 Clues a completely integrated enterainment experience.